This bracelet is designed for my friends in Louisianna. Scroll down for supplies and homework. Students must be experienced in herringbone and peyote stitch. This is not a class for the novice beader. 2 Herringbone ropes must be pre made before class. 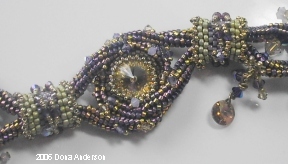 Each rope should be 12 inches long and be 6 beads around Ladder stitch 6 Delica beads and connect the first bead to the sixth bead creating a ring and start the herringbone stitch for 12 inches. Complete 2 ropes. Be creative, mix colors or make each rope a different color. If using Fireline or Power Pro do not double thread. The ropes should not be stiff. If you are a tight beader try to make them flexible. 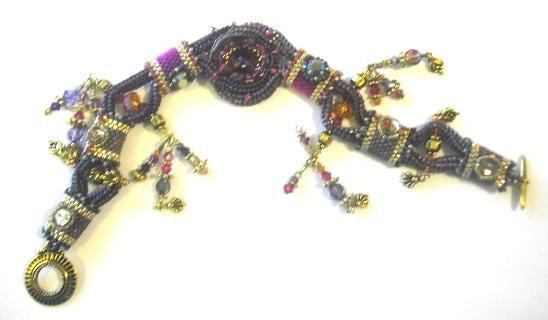 2 colors 5 grams each of size 14/15 seed beads or Charlottes, one metallic color is recommended. Eight 6 or 8 mm Round, Bicone, square or 6200 crystals or special beads or even small charms.